Celebrated rabbi and commentator on the Mishnah; lived in the second half of the fifteenth century in Italy; died in Jerusalem about 1500. He was a pupil of Joseph b. Solomon Colon (see the latter's Responsa, No. 70, ed. Venice, 62a), and became rabbi in Bertinoro, a town in the province of Flori, whence he derived his by-name, and in Castello. The desire to visit the Holy Land led him to Jerusalem; and he arrived there March 25, 1488, having commenced his journey Oct. 29, 1486. His advent in Palestine marked a new epoch for the Jewish community there and indeed for the whole country. The administration of Jewish communal affairs in Jerusalem had fallen into the hands of iniquitous officials who tyrannized over great and small. The poor were pitilessly taxed for the Mohammedan government; the rich were similarly treated and driven from the city by exorbitant demands upon them, so that the Jewish community was on the brink of ruin (see Jerusalem). Bertinoro's strong personality, his eloquence, and great reputation as a scholar led to his being accepted as the spiritual head of the community immediately upon his arrival. His first care was to raise the intellectual plane of the community, and for this purpose he interested the younger generation in the study of the Talmud and rabbinical lore, and he delivered sermons every other Sabbath in Hebrew, although the vernacular language was Arabic, one which Bertinoro never acquired. His connections in Italy supplied him with money for the support of the poor, which also added not a little to his influence. He succeeded in securing the abolition of the annual tax of 400 ducats, which had afforded such opportunity for oppression and injustice; in lieu a simple poll-tax payable direct to the government was instituted. When, on the expulsion of the Jews from Spain in 1492, many of the exiles settled in Jerusalem, Bertinoro became their intellectual leader. 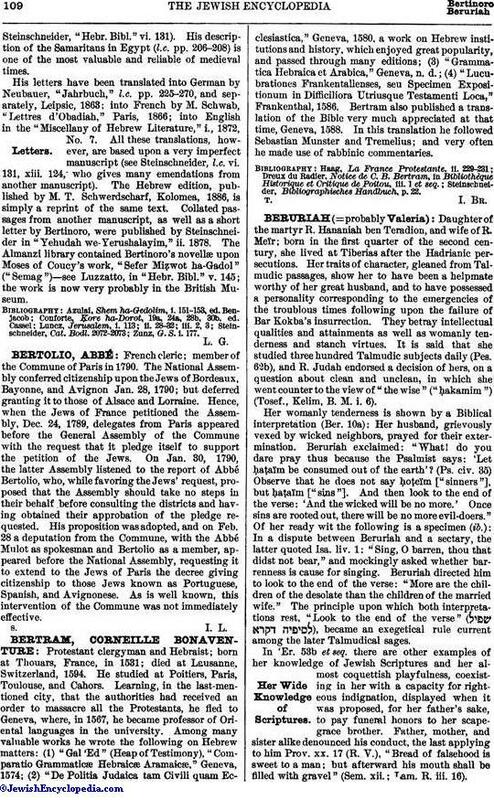 These Spanish Jews, far superior in intelligence, culture, and learning to the Arabian Jews of Palestine, presented Bertinoro with a site for a yeshibah in Jerusalem, which he founded, more than a thousand years after the extinction of the last academy in Palestine (see Academies in Palestine). Considerable support for the maintenance of the yeshibah was given by the Jews of Egypt and Turkey at Bertinoro's written solicitation. Isaac b. Nathan ibn Shulal, naggid or prince of Egypt, was especially helpful. In the decade during which Bertinoro thus controlled the best interests of the Jewish community at Jerusalem, a radical change for the better developed. Shortly after his arrival he had actually been compelled upon one occasion to dig a grave because the community had provided no one to perform that labor; a few years later there had come into existence such benevolent institutions as hospitals, charitable relief societies, and similar associations, all under excellent management. His fame and reputation spread to all parts of the Orient, and he came to be looked upon as a rabbinical authority of highest eminence; even the Mohammedan population frequently called upon him to decide judicial cases. His scrupulous conscientiousness and moral earnestness were especially recognized. For instance, he harshly reproved the rabbis for exacting fees for services at weddings and divorces, a custom then general in Germany, and did not hesitate to style them robbers (commentary on Bekorot, iv. 6). He believed it their duty to perform religious ceremonies without monetary remuneration. Bertinoro is usually known as the best commentator of the Mishnah; the importance of his commentary is illustrated by the fact that since its appearance (Venice, 1549) hardly an edition of the Mishnah has been printed without it; even Surenhuis in his Latin translation and commentary upon the Mishnah (Amsterdam, 1698-1703) translated Bertinoro. Its excellence lies in the fact that he selected the best afforded by Rashi and Maimonides and gave this in clear and easily comprehensible fashion; in the matter of originality, however, Bertinoro does not approach his distinguished predecessors, nor even his successor in this department, Yom-Ṭob; Lipmann Heller. 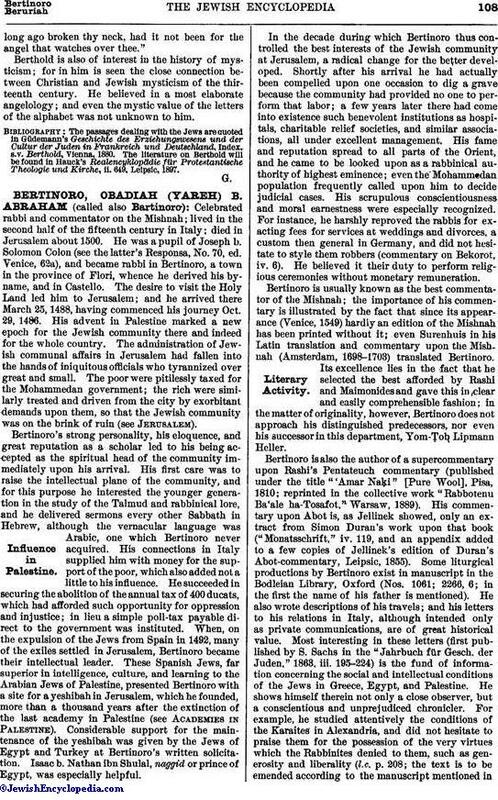 Bertinoro is also the author of a supercommentary upon Rashi's Pentateuch commentary (published under the title "'Amar Naḳi" [Pure Wool], Pisa, 1810; reprinted in the collective work "Rabbotenu Ba'ale ha-Tosafot," Warsaw, 1889). His commentary upon Abot is, as Jellinek showed, only an extract from Simon Duran's work upon that book ("Monatsschrift," iv. 119, and an appendix added to a few copies of Jellinek's edition of Duran's Abot-commentary, Leipsic, 1855). Some liturgical productions by Bertinoro exist in manuscript in the Bodleian Library, Oxford (Nos. 1061; 2266, 6; in the first the name of his father is mentioned). He also wrote descriptions of his travels; and his letters to his relations in Italy, although intended only as private communications, are of great historical value. Most interesting in these letters (first published by S. Sachs in the "Jahrbuch für Gesch. der Juden," 1863, iii. 195-224) is the fund of information concerning the social and intellectual conditions of the Jews in Greece, Egypt, and Palestine. He shows himself therein not only a close observer, but a conscientious and unprejudiced chronicler. For example, he studied attentively the conditions of the Karaites in Alexandria, and did not hesitate to praise them for the possession of the very virtues which the Rabbinites denied to them, such as generosity and liberality (l.c. p. 208; the text is to be emended according to the manuscript mentioned inSteinschneider, "Hebr. Bibl." vi. 131). His description of the Samaritans in Egypt (l.c. pp. 206-208) is one of the most valuable and reliable of medieval times. His letters have been translated into German by Neubauer, "Jahrbuch," l.c. pp. 225-270, and separately, Leipsic, 1863; into French by M. Schwab, "Lettres d'Obadiah," Paris, 1866; into English in the "Miscellany of Hebrew Literature," i., 1872, No. 7. All these translations, however, are based upon a very imperfect manuscript (see Steinschneider, l.c. vi. 131, xiii. 124, who gives many emendations from another manuscript). The Hebrew edition, published by M. T. Schwerdscharf, Kolomea, 1886, is simply a reprint of the same text. Collated passages from another manuscript, as well as a short letter by Bertinoro, were published by Steinschneider in "Yehudah we-Yerushalayim," ii. 1878. The Almanzi library contained Bertinoro's novellæ upon Moses of Coucy's work, "Sefer Miẓwot ha-Gadol" ("Semag")—see Luzzatto, in "Hebr. Bibl." v. 145; the work is now very probably in the British Museum. Zunz, G. S. i. 177.